Happy almost-New Year! While the ball-dropping festivities are still a day away, we’re already in party mode here at She Takes on the World Inc., and we’re celebrating some big wins for 2015, including just being named to the Forbes “100 Best Websites for Entrepreneurs” list, completing our biggest Conquer Club launch to date aaaand the release of my new book, The Conquer Kit: A Creative Business Planner for Women Entrepreneurs, from Penguin Random House that just hit bookshelves yesterday! Yippeeeee. 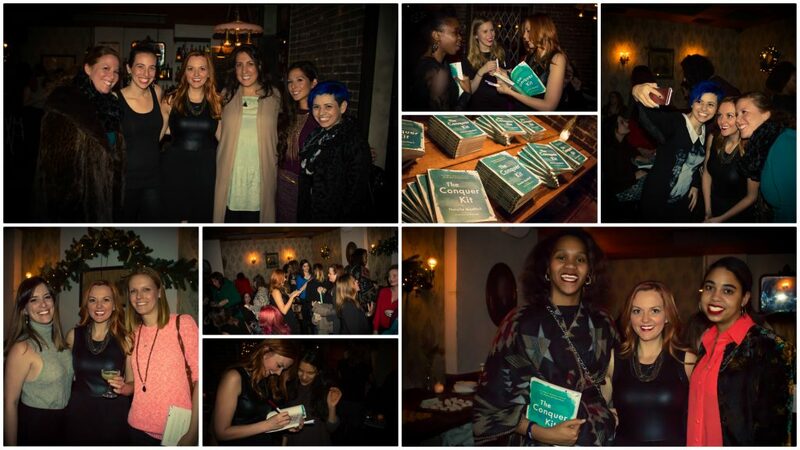 Last night we painted the town at my book launch/birthday party in New York City. It was incredible to feel so much love and support from The Conquer Club and our She Takes on the World community. I loved meeting so many Conquerors there. All of this wouldn’t mean anything if I wasn’t able to share what I’ve learned and help YOU achieve success in your own business. So let’s keep this momentum going! Today I want to help you get really fired up about growing your business and creating a game plan to skyrocket your goals in 2016. I’m really excited to let you in on my “5×5 Plan,” the exact process and template I’ve used for years to achieve my biggest goals. This is just one of the exercises you’ll find inside The Conquer Kit, which is now available everywhere books are sold! Some of you may have done this exercise with me before, but now that a new year is upon us it’s time to create a 5×5 for the 12 months ahead. Having a 5×5 plan will set you on the right path to making big gains in 2016. And again, that’s just a taste of what you will learn in The Conquer Kit, my new business planning system for entrepreneurs. Inside this gorgeous planner, we’ll delve into mindset and meditation, business systems, tactical planning, product strategy, marketing, and financial and legal how-tos…this is deep learning that gets to the core of what every successful entrepreneur needs to know, presented in a format that feels so easy and organic you’ll actually have fun doing it! Business planning has never felt this creative or authentic. I know 2016 is going to be an incredible year…and I’m looking forward to celebrating YOUR success in the year ahead. It all starts with laying a solid foundation with the systems and strategies I’ll teach you in The Conquer Kit — so let’s get started today! If you don’t already have your copy of the book, grab one here. Love this Natalie! One of my bigger picture goals is to start a Youtube Channel towards Heart-Centered Living! My favorite bigger picture goal is to buy a house and make it into a home! <3 Thank you for all of your inspiration! That’s awesome Lynn, and we’re cheering you on! your new set is gorgeous!!! One of my “Big picture” goal for 2015 is making my startup business profitable so I can hire myself and 3 women. Milestone 1: have 1000 people following our work on 3 social media sites. Looking good Vesna – just make sure you break these down into smaller steps to keep yourself on track, and get everything scheduled into your calendar 🙂 Keep us posted! Love this, Natalie – thanks for sharing! It’s a very clear method for looking at the entire year (but being flexible!). One of my big picture goals is to get many more speaking gigs for my monologue FIERCE. I know it can help and inspire many people… so I’m ready to go on the road! Love it Shannon, and thanks so much for sharing! Working on my 5 x 5, I figured there is another very useful “5” that can be included – the five days of the working week, Monday to Friday. We can assign one of those days to each major goal, and aim to do at least one little thing on that day towards reaching that goal. Mondays, at least 1 action related to goal 1. Tuesdays, goal 2. Every Wednesday, something for goal 3… and so on. That doesn’t mean we can’t work on any goal on other days. But if we commit to doing something for each goal at least on its “day” each week, then that keeps our momentum going. We never let a week “slip by” without having taken at least one step closer to each of our major goals. Thank you Steve! And yes, you could assign a day of the week to each goal if you didn’t have to buckle down and stay laser focused on one for a period of time. For example, right now I’m pretty much all about my next book and it’s taking up every day. There are other goals that you can jump between though. My big goal is to start an organic farmer’s market in NW Raleigh in NC and integrate a social media aspect with using the food to make skincare products and delicious dishes with the produce through YouTube, Instagram, Facebook, and Twitter. This 5×5 is fantastic! I have learned so much! The 9-week course changed my life and I am looking forward to following you on your station! Thank you. My big picture goal is to share more, be it on social media, making phone calls, setting meetings or attending events. This sounds like the perfect plan for a great year, really who doesn’t love a good event with good conversation. “Sharing more” is a great intention Maria! Hi Natalie! This is an amazing strategy especially for people like me who usually overthink everything. This narrows down and organizes all of the plans for this year. So in case I get so far away from my goals, I can get back on my 5×5 and see if this activity is contributing to the milestones I have to cross-out to reach my goals! One of my big goals for 2016 is launching a membership site that helps coaches and consultants build their team, and implement effective systems. Looking forward to diving in to this idea in the Conquer Club! This was really helpful !!! Thanks Natalie! My biggest goal is to go Independent by October 2016. Great reminder to get those goals and milestones down on paper – then they can’t be ignored!